A traumatic brain injury (TBI) is an event where the brain is damaged by an external physical force and the normal function of the brain is disturbed. Examples of TBIs in children include when the head experiences violent shaking ("shaken baby syndrome"), hits a stationary object such as a windshield, is hit by an object like a baseball or is penetrated by an object. TBIs are particularly devastating in children because a child's brain is still developing. When the brain is injured it can have overwhelming long-term effects on the child and the family as well. Sometimes a child will appear to recover fully from the brain injury but later in life, as the brain matures, serious behavioral and cognitive problems may emerge. Falls are the leading hospitalization cause from TBI including falls from beds, from stairs and from one level to another. Motor vehicle accidents including car crashes as well as bicycle and pedestrian accidents cause the most severe TBIs. 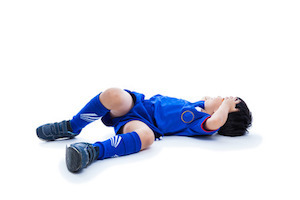 20% of children hospitalized for sports-related injuries sustain a TBI. TBIs also often result from recreational activities. Using wheeled recreational equipment like bikes, skateboards, in-line skates, non-motorized scooters and even "wheelies" (sneakers with retractable rollers). Winter sports activities like skiing and snowboarding. If your child has experienced any type of trauma, watch carefully for signs of TBI. TBI symptoms may be obvious or more subtle and can include persistent headache or neck pain, difficulty concentrating or remembering, feeling tired or listless, mood changes, sleep pattern changes, dizziness, nausea, increased sensitivity to lights, ringing in the ears and blurred vision. Always use the correct child restraint in motor vehicles based on the child's age and weight. Learn the rules in our state from the Florida Department of Highway Safety and Motor Vehicles. Make sure that children wear appropriate and well-fitting helmets and other protective gear for all sports and recreational activities. Use safety gates on stairs, top and bottom. Add a rubber mat to the tub and secure all rugs with non-slip backing. Install window guards so young children won't fall out of open windows. Check that playground surfaces have shock-absorbing materials like sand or hardwood mulch. If you or a family member has sustained any type of brain injury or has been injured in any type of car accident or personal injury, please contact the Law Offices of Diana Santa Maria, P.A. immediately. Our experienced attorneys will fight for the compensation you deserve. Please call us for a free consultation. Attorneys Diana Santa Maria and Laura D. Dolin, personal injury attorneys in Fort Lauderdale, will fight to secure justice for you and your family. You can reach us at (954) 434-1077 or contact us via the website.